Mysuru: The University of Mysore that has many firsts to its credit held its 98th Annual Convocation at Crawford Hall this morning and in a break in tradition, both Governor Vajubhai Rudabhai Vala, who is the Chancellor of Universities and Minister for Higher Education Basavaraja Rayareddi, who is the Pro-Chancellor of the University, stayed away from the ceremony. There was another break in tradition as no Honorary Doctorates were awarded this time. Though the Governor’s name was not printed in the invitation and the University authorities had earlier stated that the Governor will not attend the convocation, the absence of Pro-Chancellor raised many eyebrows. However, the saving grace was the august presence of former Judge of Supreme Court and former Karnataka Lokayukta Justice N. Santosh Hegde, who delivered the Convocation address and inspired the students to excel in academics and in life. The Convocation was held in the presence of In-Charge Vice-Chancellor Prof. C. Basavaraju, Registrar D. Bharathi, Registrar (Evaluation) Prof. J. Somashekar and a host of Syndicate and Academic Council members, who were wearing the traditional Mysore Peta. The entire event got over in just one-and-a-half hours, again a break in tradition as it would otherwise take at least five to six hours at the sprawling Crawford Hall with degree and Ph.D. holders dressed up for the occasion. Sheen was taken off from today’s event as there were no Honorary Doctorates this time. The University had started the tradition of giving Honorary Doctorates since the last 50 years. However, this is for the first time in the last 25 years that these doctorates were not awarded. The Honorary Doctorates Selection Committee had prepared a list of 12 names and had shortlisted three names for the Honorary Doctorates and had sent the same to Raj Bhavan, the Governor’s Office for approval. 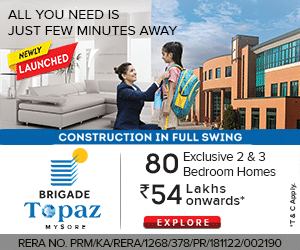 However, sources said that the Raj Bhavan did not approve the names, forcing the University to depart from the tradition of awarding Honorary Doctorates this time. In all, 27,502 students, 62% of them women, were awarded different degrees; 575 researchers got their Ph.Ds; 348 students secured medals and 168 students bagged various prizes while 7,576 students got Post-Graduate degrees. 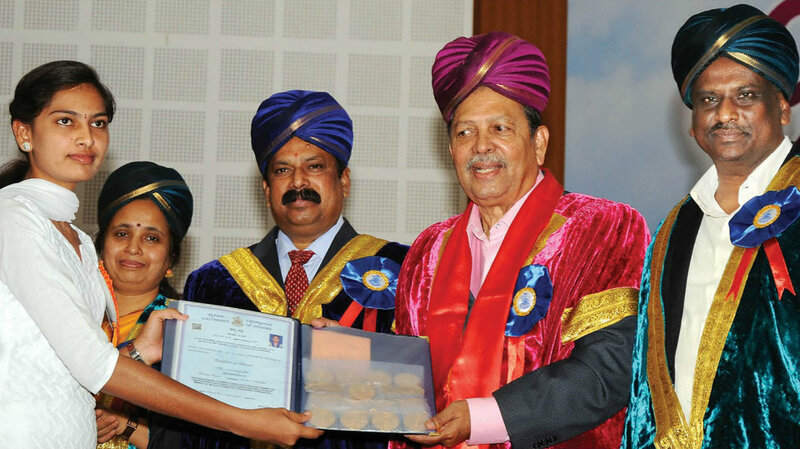 Degrees and medals were presented to some students by Justice Santosh Hegde. In his convocation address, Santosh Hegde called upon students to remember the sacrifice of parents and teachers. “Many parents have sacrificed their pleasures and comforts for your success. Please remember that you owe gratitude to them as also to your teachers for your success. Of course, you have worked hard to achieve what you have achieved today. Hence, it is a day for celebrations,” he said. The Mysore University toppers proudly displaying their medals which they received at the Convocation this morning. “One of the main reasons for the growth of corruption in this country is the attitude of the society towards corruption. Today’s society has lost its sense of differentiation between legitimate wealth and illegitimate wealth. It considers the wealth as a great sign of success, without even trying to find out how the wealth is acquired. It treats the people who have become illegitimately wealthy on par with the people who have become wealthy legitimately and after hard work,” he said. In Arts faculty, R. Dhanalakshmi is the topper and has secured the highest number of medals (9) and cash prizes (8) in an undergraduate course (BA). R. Supreethi has scored the highest marks in a post-graduate course. K.G. Vanaja has secured the highest number of medals (8) and cash prizes (4). In Commerce faculty, Mohanthi Mohan has secured the highest marks in B.Com by winning two medals and one cash prize. In post-graduation, K. Divya has secured the highest marks in M.Com and B.R. Mahadeva Prasad has won four medals in MBA (Agri Business). In Education faculty, in BP.Ed. G.P Shashanka has secured the highest marks and has won five medals and one cash prize. In M.Ed., S. Divyashri has secured five medals and one cash prize. “In Law faculty, Monjurlang L. Suchiang of LLM has secured the highest marks and has won two medals and two cash prizes. In the faculty of Science and Technology, in B.Sc., Humairne Ridha has secured the highest marks, while D.P. Manasa has won seven medals and nine cash prizes. In M.Sc. Mathematics, K. Pushpa has secured the highest marks while C.N. Shambhavi has won 13 medals and four cash prizes in M.Sc. Chemistry.